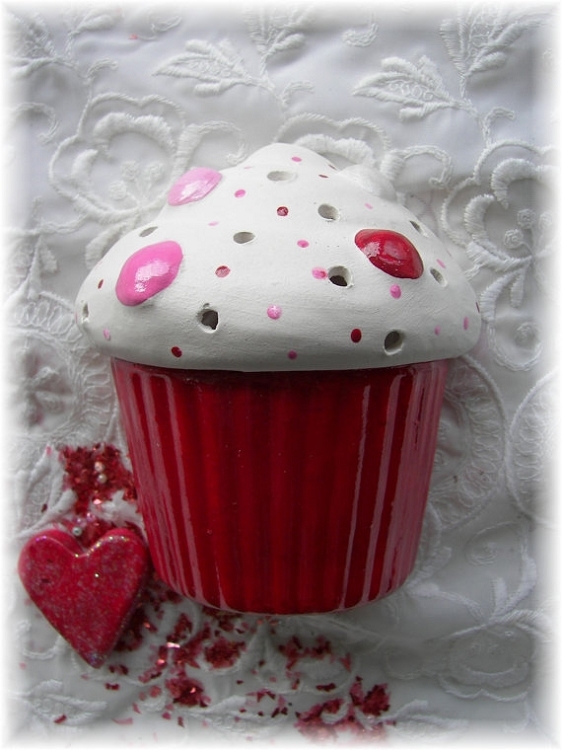 Valentine Holiday Night Light Red Velvet Ceramic Cupcake Wall mount Night Light In stock ready to ship in these colors! It measures a little larger than than a real cupcake, bottom 3" across and 2 1/4" high..top is about 4 1/4" across. I pour them from a mold, clean them, then fire to bisque~ This is a CERAMIC cupcake wall mount nightlight shown in Red Velvet colors~ The mnm's on top are in pinks and red ~The bottom is a Red finish~Shown on a yellow wall when lit~ Available in in other colors too~regular clear bulb with this one~ My original design, I make each one by hand. I pour them from a mold, clean them and fire them to bisque~then I apply several different acrylic paint colors to make it look frosting like~Then a high gloss clear glaze. The bulbs are easy to replace, like any night~ Thank you for visiting my shop!